Rinse the fresh blue mussels in tap water. Place in a large saucepan with a small amount of water on high heat. Cover and let steam until shells open (5 – 7 minutes). Remove meats, strain and reserve broth. Add enough hot water to broth to make 4 cups (1 L). Melt butter in pot, add onion, and sauté until transparent. Add flour and stir to blend thoroughly with fat, gradually add broth and water mixture, bring to a boil. Add potatoes, simmer until nearly done. 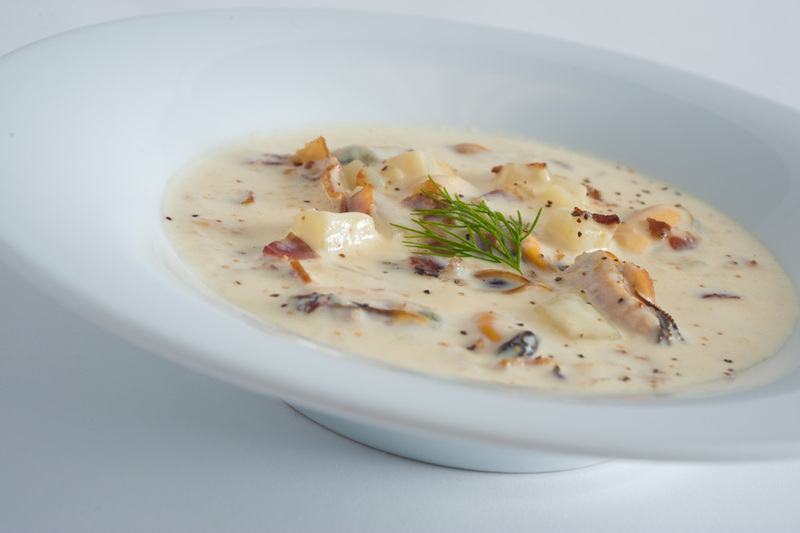 Add fresh blue mussels and gently stir in milk and cream; heat. Garnish with bacon strips or crumbled. Also a touch of paprika adds nice colour.